The Kershaw Reverb has potential as a duty knife for utility work. 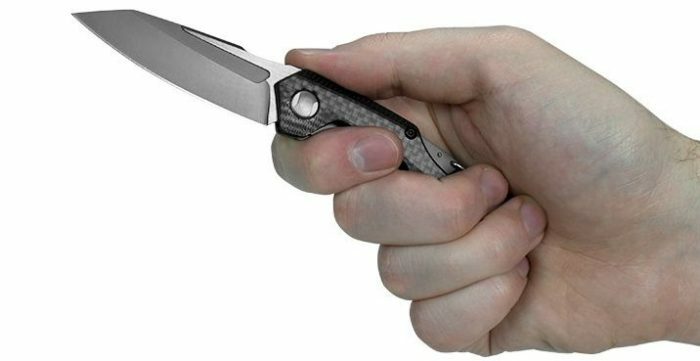 Kershaw was in overdrive at SHOT Show this year delivering dozens of new knife options. One of the new knives is called the Reverb. The Reverb is a small folding knife with a unique blade design, and is feature-built for everyday carry, call-out or bug-out bag, hiking, or backpacking. The Reverb could be a great addition to your duty bag for those little every-day jobs that come up on the road. The Kershaw Reverb is made with a 8Cr13MoV blade, which should hold an edge well while still allowing sharpening if needed. In addition, the blade grinds have a PVD coating for extra protection against the elements. Kershaw Reverb’s smaller profile expands carry options, while remaining useful for utility work. The Reverb knife is a small folding knife ideally designed for every day carry for utility cutting jobs. The small profile will easily fit into a pants pocket, and the hinged carabiner style attachment clip on the top rear of the handle allows for an easy attachment to bags, packs, other items. This provided the Reverb with a lot of carry options, while not taking up a lot of space. Kershaw uses a 8Cr13M0V steel blade on the Reverb to provide respectable blade strength and edge integrity. The blade should hold an edge well, while being soft enough to allow sharpening back to a good edge if necessary. The blade takes on a modified drop-point shape, with a nod to the Wharncliffe design as well. This blade design provides both a good cutting edge and a stabbing point as well. The blade grinds are coated with PVD to provide excellent corrosion and wear resistance. The blade flats take on a satin finish to provide an appealing two-tone appearance when the blade is extended. The Reverb is a manual-opening knife designed to be lightweight and slim. As such, there are no thumb studs or flippers included on the blade to reduce any snagging potential. However, the large machined recesses on the blade do allow the user to open the blade one-handed by pressing outward on the recess with a thumb. A little practice should make perfect for this operation, and ensure the user is placing their thumb on the blade recesses and not near the cutting edge. There is a frame lock to lock the blade open for safe use operation. However, unlike traditional frame locks that run the length of the handle, the Reverb’s is a much smaller version that is only about 1/3 of the handle’s length. The frame lock is just a little trickier to push out of the way than the larger traditional styles (see video below, 7:08). The Reverb’s front handle scale is lightweight G-10 with a carbon fiber overlay. This configuration provides outstanding strength, comfort, and longevity while also producing a very appealing overall knife. The grips are contoured by Kershaw to enhance a solid grip on this little knife. There is a one-position pocket clip carry option as well. The pocket clip is on the right side, and is designed for “deep pocket” tip-up carry. The Kershaw Reverb folds into a very compact carry package, with several carry options. I was able to play around with the Kershaw Reverb a bit at SHOT Show this year. Though the knife is a bit small for my particular preferences, I can still see the knife making a valuable asset for a variety of utility purposes. The drop-point blade, quality steel and grips, make the Reverb ready to tackle a lot of the utility cut jobs confronted on the streets (or back woods). This is not a survival or self-defense knife, in my opinion. I know some manufacturers and knife enthusiasts get all excited about a small knife and its potential, but in my opinion this knife is too small to adequately maintain a grip in the rigors of a self-defense situation. However, this knife is ideally suited for opening boxes, cutting away flare packaging, scraping fraudulent license tabs off, and other useful and common patrol functions. With a compact pocket clip providing “deep pocket” carry, or the carabiner-style clip, the Reverb has several very good carry options both on your person or on a pack or bag. This could be very beneficial on a bail-out-bag, or active shooter bag, as well as a sniper’s pack as well. Being so small will also allow the Reverb to simply be carried inside a pocket without using the clip.